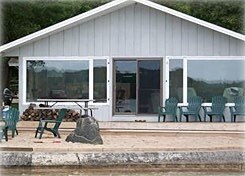 We offer a comfortable cottage directly on Little Traverse Lake. There is a spacious deck overlooking the water with 2 large picnic tables for outdoor dining. The entire living room which faces the lake is windows that overlook the spectacular sunset views that northern Michigan has to offer. There is a large, knotty pine living room with a cathedral ceiling and a massive fieldstone fireplace, a fully-stocked kitchen with a gorgeous lake view, and a screened-in porch. The 3 bedrooms consist of one room with a king size bed, a second room with a queen bed, and a third room with 2 sets of bunk beds with double beds on the bottom and twins on top.